Detailed coordination efforts allowed the cancer center’s linear accelerators to be installed early, allowing the hospital to begin providing care three months sooner than originally anticipated. To provide convenient access to advanced cancer services to southeastern Massachusetts residents, Southcoast Hospitals Group’s flagship cancer care center offers one-stop care for radiation therapy, chemotherapy, surgery, diagnostic imaging services, and education and support services. 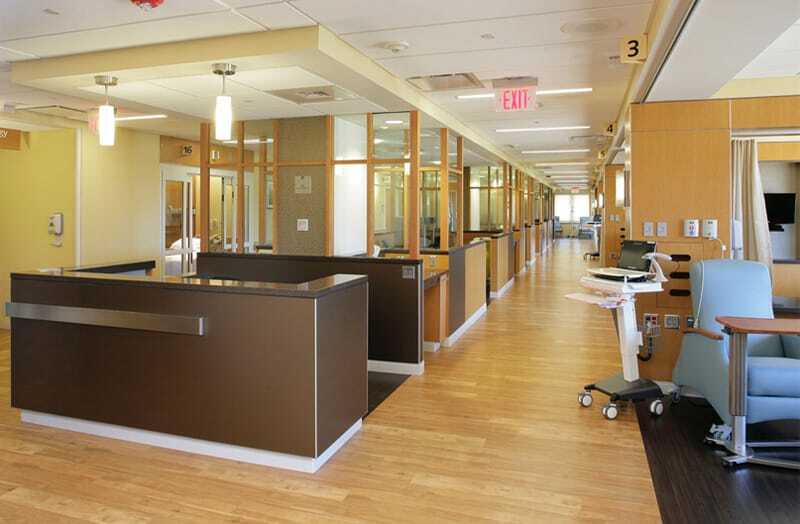 Charged with transforming farmland into a state-of-the-art cancer care facility, Gilbane’s preconstruction and construction management services focused on achieving project completion as quickly as possible. Simultaneous crews were employed to bring utilities to the site, while also beginning construction on the building. Equipment selection was a critical element, and Gilbane worked closely with the hospital group to determine what decisions could be made early, while offering work-around solutions – such as boxing out areas for future concrete pours – when equipment technology decisions had to be delayed to ensure the most up to date technology could be provided. The new outpatient center has the very latest advanced technology to meet the growing needs of the region’s cancer patients. Amenities include healing gardens, café, boutique and massage therapy room. A new linear accelerator offers a combination of real-time image guidance in radiotherapy (IGRT) and intensity modulated radiation therapy (IMRT). This technology – coupled with state-of-the-art diagnostic services such as a Positron Emission Therapy (PET) scanner – made this center the area’s most advanced cancer program upon completion. Gilbane took a proactive approach to installation of the linear accelerators to avoid testing, start-up and commissioning of the equipment after substantial completion. Instead, the team worked closely with the owner to provide areas ready for installation, timed to align the completion of equipment commissioning with the facility opening date. Ultimately, this resulted in savings of 3 months off the schedule!